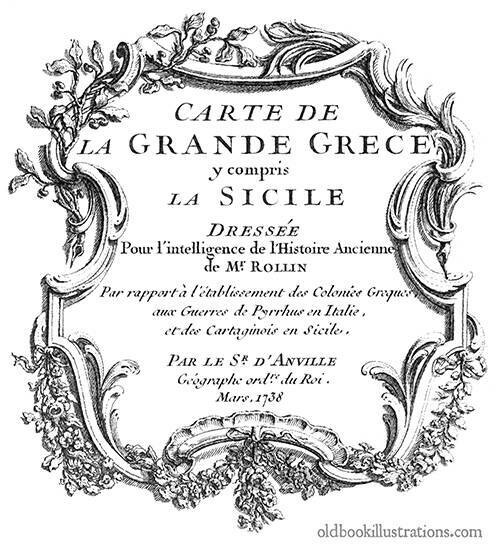 Rococo cartouche for a map of ancient Greece and Sicily. 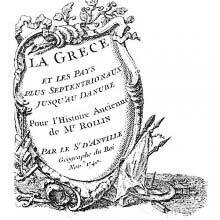 Rococo cartouche for a map of Greece and Sicily at the time of Pyrrhus’s wars. The irregular frame is decorated with foliage and shell-like designs. The cartographer for this series of maps was Jean-Baptiste Bourguignon d’Anville. Jacques-Philippe Le Bas seems to have been consistently responsible for the artwork, although his name doesn’t appear on every map. The publication date we mention is that which appears in the cartouche (i.e. not necessarily the publication date of the book the map refers to: we don’t know if the maps were included with the books or published separately).